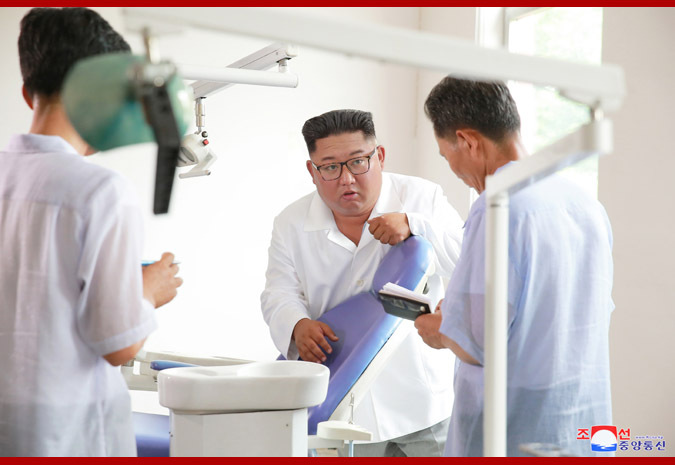 Pyongyang, August 21 (KCNA) -- Kim Jong Un, chairman of the Workers' Party of Korea, chairman of the State Affairs Commission of the Democratic People's Republic of Korea and supreme commander of the Korean People's Army, inspected the Myohyangsan Medical Appliances Factory. The Party has stressed the need to intensify its guidance over the public health work and called for the Cabinet and the people's power organs at all levels to fully discharge their responsibility and role in the work for consolidating the material and technical foundation of the public health sector as the public health policy in our country is premised on the state investment and supply of materials, but officials are very idle and irresponsible in doing so, he pointed out. He was accompanied by Hwang Pyong So, first vice department director of the Central Committee of the Workers' Party of Korea; Jo Yong Won, Kim Yong Hwan, Pak Song Chol, O Il Jong and Kim Yong Su, vice department directors of the C.C., WPK; Kim Chang Son, department director of the State Affairs Commission; and Ma Won Chun, bureau director of the SAC.